Order from InterVarsity Press, your favorite local bookseller or wherever boooks are sold. But you are not alone. Erica Young Reitz specializes in helping college seniors and recent graduates navigate the transition to postcollege life. 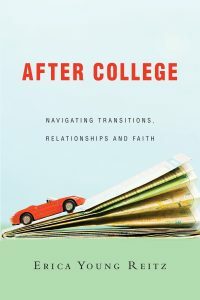 She offers practical tools for a life of faithfulness, addressing the top issues graduates face: making decisions, finding friends, managing money, discerning your calling and much more. Discover how to flourish as a Christ-follower in a complex world. “Erica Reitz has done a masterful job in calling attention to the comprehensive and complex nature of this challenge. She has brought to the task a balance of sound theology, thoughtful reflection and practical advice.